FAKE NEWS: NBC Spreading Blatant LIES About So-Called "Ghost Guns"
Once again, the liberal mainstream media has affirmed their role as Democrat propaganda pushers and fake news purveyors, with an alarmist story about “ghost guns” that was thoroughly debunked by Bearing Arms. 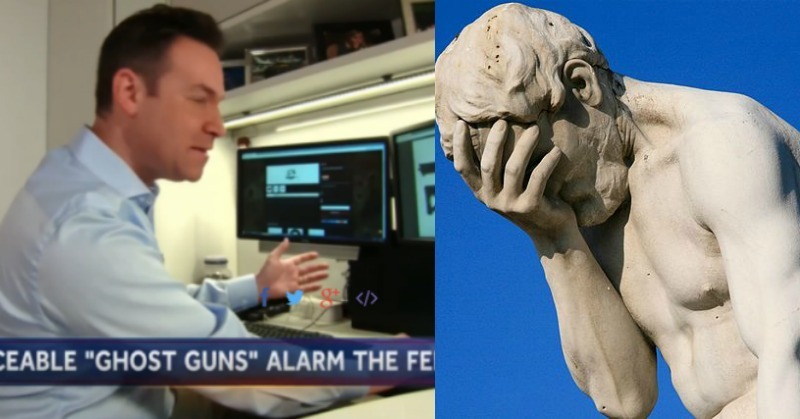 NBC News’ so-called investigative news reporter Jeff Rossen put forward a fake news package in which the Leftist network asserted that putting together an untraceable, so-called “ghost gun” was as simple as buying some parts/kits on the interwebs and easy peasy lemon squeazy, you’ve got yourself a gun. Not only that, NBC News asserted that you’ve got a gun that the government can’t trace which could be built by someone that wouldn’t pass the background checks that the Left thinks are, aside from taking guns away from law-abiding citizens, the be all to end all. According to NBC News, this represents a “legal loophole” and is super-duper scary and stuff. The problem is, as usual with the MSM, it’s fake news. I know this from firsthand experience, as I’ve built semi-automatic firearms from the ground up, including AR-15s and an AKM. As he went on to explain in their excellent piece, it “takes time, specialized tools, and knowledge to complete,” unlike the NBC News report that made it seem as if anyone could order some parts and slap together an “untraceable” weapon. The Left continues to make it abundantly clear to anyone that wasn’t already aware that their goal isn’t to keep people safe — it’s to push their radical agenda, and a major part of that requires that they disarm the public. If they wanted people to be safe they would encourage Americans to exercise their Second Amendment right. Instead, they lie and fear-monger in an attempt to get people to willingly give up their rights to pave the way for them to have a much easier path to dismantling the Second Amendment and the rest of the Constitution. Criminals are going to get their hands on weapons. It’s as simple as that. No laws will stop it. But taking away our guns does nothing to stop that in any way. Ironically, even if NBC’s fear-mongering fake news piece was true, it would provide another example of why it’s even more important for law-abiding citizens to arm themselves. Instead, the Left pushes to create a large class of sitting ducks that are terminally dependent on the government.